SPC Control Arm - Dezod Motorsports Inc - Home of the automotive performance enthusiast since 2002. These fully adjustable Upper Control Arms transform your classic Mopar from sluggish, non-responsive handling to high performance FUN! Dial in additional positive caster, adjust your camber, and enjoy the feel of up to 6 degrees adjustment! Arms include stock ball joints. Sold as individual arms. 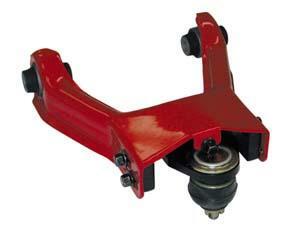 Ball joint are often included (check Item Notes for specifis). These arms lower your front end by 1” and add 1° positive caster for an aggressive, ready-to-run stance. Optional Ride Height Tuning Kits are available for use with our Pro Series Springs or ‘standard type’ springs to raise the ride height if desired. If you have coilovers use our Coilover Mount and Spacer Plate. For specific vehicles this tubular style arm is great when lowering this popular vehicle, or for correcting rear camber on stock vehicles. These extreme lower control arms are for Performance Vehicles. Made from aircraft aluminum alloy, these arms are available in a silver, blur or red finish. When teamed up with front and rear camber arms SPC Performance provides you with a complete alignment solution when lowering your car. These arms fit for your ride, giving you a range of camber change. Great for popular tuner vehicles, these machined parts are in a stand-out silver anodized finished with SPC “Red” nuts.